Why do you think you need a p rest? Don't do it just because the books say so! You have experienced brewers here telling you that it isn't necessary. Isn't that enough to at least make you want to see? Keep it simple, then when you have a handle on things give the p rest a try. Jeez, let the guy do a protein rest rest if he wants to. Don't do it because the books say so... really? I'll take your word there are lots of experienced brewers here. For sure, there are lots of opinionated brewers here. And truth be told, most of those brewers mash in coolers and would find it very difficult to do a multi-step mash. To me this smacks of--this is the way I do it, so you ought to too. Beer makes you feel the way you should without beer. To me this smacks of--this is the way I do it, so you ought to too. Sorry, didn't mean to come across like that. What I was getting at is that on your first AG brew, there's gonna be a lot of learning going on without the added complexity of a step mash. In addition to that, based on the experience of many of the homebrewers who have tried it, there will be no detriment to the beer by not doing a protein rest. I certainly didn't mean to discourage the OP, or anyone else, from ever using a step mash. I do it myself from time to time (although I don't often use a p rest). And yes, I do it in a cooler, which works just fine, thank you! And BTW, I've used a P rest on my last 3 all pils malt beers, just to once again see if I might be missing something. As far as I can tell, there's no difference from when I made them without a p rest. YMMV. And truth be told, most of those brewers mash in coolers and would find it very difficult to do a multi-step mash. I do mash in orange cooler and do step mashes. There is nothing wrong about coolers. 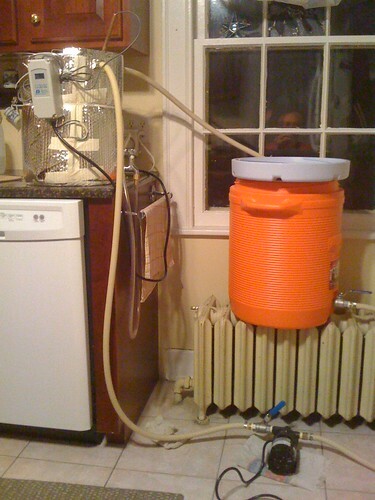 Can we class that cooler sitting on a radiator as a "direct fired mash tun" ? Nice try but no cigar. I'm in total agreement regarding not performing a protein rest for almost every beer since modern malts are already highly modified. In the case of a Weissbier, there is a need for a low temperature rest to promote the formation of Ferulic Acid that will be used to create the 4 vinylguacol that is responsible for the clove character in these beers. If I'm not mistaken, a rest in the 120 to 125 F range is good for Ferulic Acid formation. If you don't really want cloveiness in your weissbier, then you don't need to do this step. Since I don't want to overly degrade the barley component of my Weissbier grists, I typically mash only the wheat malt at the low temp and then add the barley as a separate doughin at a higher temp. In the case of a Weissbier, there is a need for a low temperature rest to promote the formation of Ferulic Acid that will be used to create the 4 vinylguacol that is responsible for the clove character in these beers. I don't think that there is a need for that rest. You can also make sufficiently phenolic Weissbiers w/o this rest. The yeast choice plays a big role as well. Since the release of ferulic acid is favored at higher pH (5.7+) and protoelytic enzymes like to work more on the sour side (~4.9-5.2) you can also limit the protein degradation by lowering the mash pH to 5.4 - 5.5 after you reached the sacharificantion rest.